Sci-Tech Discovery Center is hosting a MakerSpace Open House on Thursday, September 22, 2016, from 5:30pm to 8pm. This event is free and open to the public! Guests will have a chance to see Maker demos and a Rube Goldberg Team Challenge by local makers, participate in hands-on activities, and enjoy refreshments. 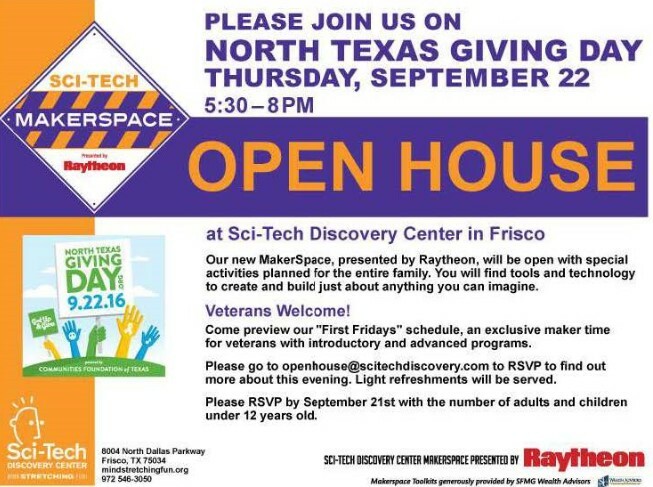 September 22nd is also North Texas Giving Day and Sci-Tech’s sponsor Raytheon will present a $25,000 check to the advisory board and executive director at 6:30 p.m. that day. To celebrate North Texas Giving Day tomorrow, the National Videogame Museum in Frisco is offering free admission to the public from 5-8 p.m. Enjoy playing your favorite throwback and modern games with friends and family! Sci-Tech will have computers set up for guests to make optional donations to the museum via the Giving Day website to support funding for STEM programs for Title I students in the Dallas/Fort Worth Metroplex as well as for the MakerSpace to preserver rare gams, consoles, and other museum artifacts.